Hi friends! Alicia here again from Sew What Alicia. Christmas is almost here again! I know you are probably pulling out your tree and putting all the ornaments on the tree. Every year I have more and more ornaments that my kids have made at school! This year I decided to start a new tradition and make my own ornaments with my boys! Here is how to sew a felt keepsake ornament. Grab your little one and have them place their hand down with their fingers wide (starfish hands we call it) on one piece of felt. Trace the hand with a pen. We are going to need two of the same hand. Since the felt is stiff it can be hard to cut through two layers. Cut the first hand out and then use it as a template to cut the second hand out. You can see I chose to use one green and one red piece of felt. Once you have both hands cut out then you need to decide if you are going to write the name and date on the hand. If you choose to then here are the steps. On your regular sewing machine attach your quilting foot and plate. I drew my son's name on a piece of paper in cursive so that I would have a reference as I went. Then simply guide your felt hand through the machine drawing the name or date as you go. I put the name on one side and the year on the other side. Be sure to check that you are sewing so the writing will face out when the hands come together. Next cut a strip of ribbon that measures 4". Fold it over to create a loop. Place the hands together and tuck the ribbon between the two where the wrist meets. The last step is to top-stitch around the hand and fingers. If you are using stiff felt you might want to consider using a heavy duty needle depending on your machine. Two layers of the felt is a lot to get through. 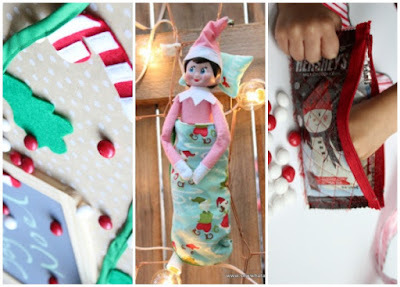 You could also hand stitch and use a cute blanket stitch to attach the hands together, but with two little boys I obviously have no time for that!! Hang it up on the tree. These would make great grandparent gifts! Every year you will be able to see how much your little's hand has grown! You can keep these and share them with your grandkids! I am totally in love with this project! 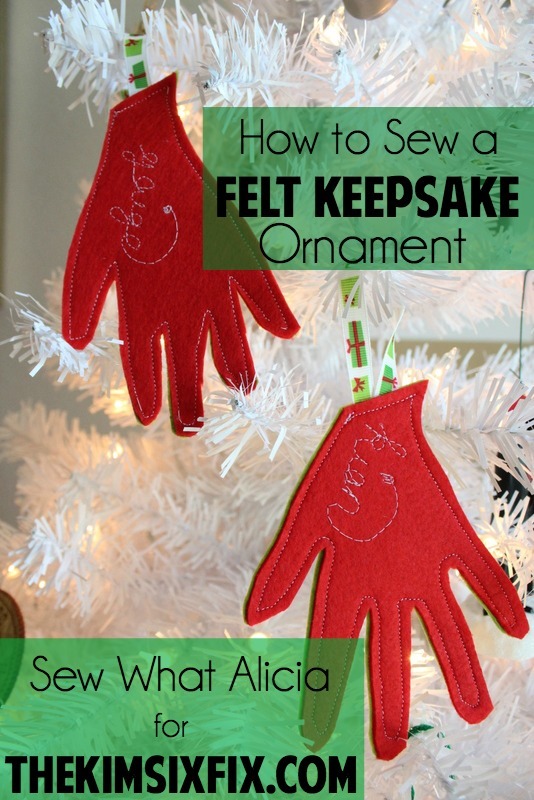 Thanks for letting me share this felt keepsake ornament with you! You can find me over on Sew What Alicia sharing sewing tutorials and other great sewing tips!